I’ve been waiting for the day that my physician or hospital hands me an iPad and lets me sing-in on a nice app. That day is here! 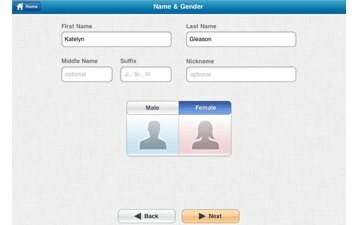 Electronic health record (EHR) platform Drchrono just released OnPatient, an iPad application that health care providers can now use in lieu of paper forms and clunky clipboards. The application allows health care providers to customize patient checkin. Patients can then input their personal, demographic and insurance info, snap a profile photo, review medications and allergies, and automatically keep their records updated. OnPatient [iTunes link] integrates with Drchrono’s existing suite of iPad EHR services specifically intended to help doctors and health care providers modernize their record keeping processes. The new application is ambitious in scope — it would require health providers to start handing out pricey iPads instead of cheaper, more disposable clipboards. However, the promise of a paper-free, up-to-do patient tracking system might be enough to entice wealthier medical practices to make the switch. Drchrono is announcing Thursday that it raised an additional $650,000 in seed funding from DST Global’s Yuri Milner and General Catalyst. The startup previously raised $675,000 from General Catalyst, Charles River Ventures, 500 Startups and Angel investors.